When drilling in a remote location, as in the case of a mission project in a developing country, finding a suitable groundwater source to tap into is critical to the well’s long-term viability. It’s important to find an aquifer large enough to support the surrounding communities. Use clues from the landscape and lean on local knowledge to locate an area where groundwater is close enough to the surface to reach. Also, consider how deep the rig you are working with can drill. For example, Lone Star’s mechanically-powered LS200 can drill to 200 feet, while a hydraulic rig, such as the LS300H+, can reach depths of 300 feet. Ask locals where they currently get their water. Existing hand-dug wells will reveal groundwater depth and give insight into subsurface soil properties. Sand or gravel areas in the bottom of valleys will often be home to groundwater. These layers can be covered by clay or silt, so it’s prudent to check these areas thoroughly. Natural springs usually indicate groundwater is nearby. A spring that flows year-round will likely reveal a productive aquifer. Even if a spring dries up at times it may still be atop a suitable groundwater supply, so it is worth looking into further. If there are streams in the area, look for sections where the flow is greater. This can mean groundwater is discharging into the stream, pointing to a good spot to drill. Groundwater at shallow depths often can nourish above-ground vegetation. Trees or shrubs that stay green in dry seasons may have roots that can reach the supply. Even greener patches of grass can indicate close-to-surface groundwater. Animals, especially bees and pigs, can be talented at finding groundwater. A white crust on the ground surface may be salt or other mineral deposits left after groundwater has evaporated, indicating a reservoir underneath. Finally, remember that finding a site that produces a sufficient amount of water is more important than choosing a convenient location. Drilling close to a community should not cause drillers to sacrifice well viability. 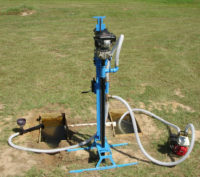 For more guidance on choosing a water well location contact a Lone Star expert.